Please use these guidelines for placing orders for Holiday Delivery. We use the USPS Guidelines for delivery by December 24th. We will guarantee that your order will ship for delivery by these dates. We cannot guarantee the service of the USPS Priority Mail or First Class Mail. For delivery of your custom order by Dec. 24th. clearance or the mailing service in foreign countries. We are getting orders out as quickly as possible during this busy season. Your order can ship the same business day! shipping option that you select when completing your order. Need a stamp (or Gift) fast? Try this option. Rush Service is only available on a Pre-ink Stamp. Orders placed for Rubber Art-Stamps & Supplies (with no custom stamps) please allow 1-3 business days for your order to be processed and completed. We do not backorder. Refunds will be issued for out of stock items. We process orders promptly: shipments of stock items are made within 1-3 business days - this time may vary due to seasonal business. Availability and prices are subject to change without notice. If ordering a custom stamp please allow 5-10 business days for your order to be manufactured and completed. We process orders as quickly as possible. Usual delivery time is 5-10 business days after your order has been completed. After your stamp has been produced (allow 5-10 business days) it will ship by the method you select when checking out. NOTE: Choosing a faster shipping method, such as UPS Next Day Air does not imply that the order will ship in 1-2 days. There is still a processing time of 5-10 business days. 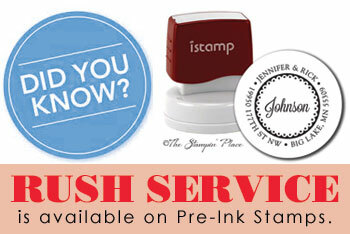 RUSH SERVICE is only available for PRE-INK Stamps. When you place an order, we will estimate shipping and delivery dates for you based on the availability of your items and the shipping options you choose. Depending on the shipping provider you choose, shipping date estimates may appear on the shipping quotes page. This date is for shipping time only, see above for processing time. You may return most new, unopened, non-custom made items within 30 days of delivery for a full refund. Please see description below for eligibility of return items. Return of unused stock merchandise (non-custom items) must be made within 30 days of receipt. All returned unused merchandise is subject to a 15% re-stocking fee. Shipping and Handling charges are not refundable. Orders for custom or special order items cannot be returned or cancelled. Shipping and handling charges are not refundable. If custom stamp is made as entered, then we are not responsible for any typographical errors. Errors must be reported to us within 30 days of purchase to be eligible for correction. We are a stamper friendly company. Yes! You can use our designs for hand-stamping items for resale. We only ask that you sign and return a permission form for our files. Download the permission form. The entire contents of this website/online catalog are copyrighted by The Stamp Pad Co., Inc. Reproduction electronically or mechanically is strictly prohibited without written consent of The Stamp Pad Co., Inc. The use of all of our art-stamp designs is limited to hand stamping only. We also do not allow our images to be altered. No reproduction by electronic or mechanical means is allowed including, but not limited to, use on the Internet, scanning, video or digital reproduction, copy machines, printing, etc., without specific written permission from The Stamp Pad Co., Inc. If you wish to opt out of receiving offers directly from Custom Stamp Place: A division of The Stampin' Place, you can unsubscribe by following the opt-out instructions in the emails that they send you located at the footer of the communication. We can be reached by postal mail at PO Box 43, Big Lake MN 55309, or by phone at 1-800-634-3717. You can email us at info@stampin.com with questions, comments or suggestions. • PRODUCTS, CONTENT AND SPECIFICATIONS. We attempt to ensure that information on this Web Site is complete, accurate and current. Despite our efforts, the information on this Web Site may occasionally be inaccurate, incomplete or out of date. We make no representation as to the completeness, accuracy or currentness of any information on this Web Site. For example, products included on the Web Site may be unavailable, may have different attributes than those listed, or may actually carry a different price than that stated on the Web Site. In addition, we may make changes in information about price and availability without notice. We will correct any pricing errors on the Web Site as and when discovered. The Web Site contains a large number of products and services and it is always possible that, despite our best efforts, some of the products or services listed on the Web Site may be incorrectly priced. We will normally verify prices as part of our shipping procedures so that, where the correct price is less than our stated price; we will charge the lower amount when shipping the products to you. If the correct price is higher than the price stated on the Web Site, we will normally, at our discretion, either contact you for instructions before shipping the product, or reject your order and notify you of such rejection. We shall not provide the products to you at the incorrect (lower) price, even after we have sent you an Order Confirmation or a Shipping Confirmation, if the pricing error is obvious and unmistakable and could have reasonably been recognized by you as a pricing error. • USE OF THIS WEB SITE. The Web Site design and all text, graphics, information, content, and other material displayed on or that can be downloaded from this Web Site are either the property of, or used with permission by, The Stampin' Place, and are protected by copyright, trademark and other laws and may not be used except as permitted in these Terms and Conditions or with the prior written permission of the owner of such material. You may not modify the information or materials located on this Web Site in any way or reproduce or publicly display, perform, or distribute or otherwise use any such materials for any public or commercial purpose. Any unauthorized use of any such information or materials may violate copyright laws, trademark laws, laws of privacy and publicity, and other laws and regulations. You are responsible for maintaining the confidentiality of your account information and password and for restricting access to such information and to your computer. You agree to accept responsibility for all activities that occur under your account or password. The Web Site contains copyrighted material, including, without limitation, text, software, photos, audio and video clips, graphics, illustrations, images, logos, and music and sound. This Web Site is protected by copyright as a collective work, pursuant to U.S. copyright laws, international conventions, and other copyright laws. The Stampin' Place and third party content providers also own (or have the right to use) copyrights in the content original to them. • LINKING TO THIS WEB SITE. • REVISIONS TO THESE TERMS AND CONDITIONS. You or we may suspend or terminate your account or your use of this Web Site at any time, for any reason or for no reason. You are personally liable for any orders that you place or charges that you incur prior to termination. We reserve the right to change, suspend, or discontinue all or any aspect of this Web Site at any time without notice. Additional Assistance. If you do not understand any of the foregoing Terms and Conditions or if you have any questions or comments, we invite you to email us at info@stampin.com.